After such a whirlwind of a weekend, I decided I couldn't write about anything but the event that made the last few days weeks months beautifully chaotic. Hallie started asking to take dance lessons at three years old, and despite having many reservations, I signed her up for her first class - a combo that included ballet, tap, and jazz - when she turned four. Now here we are, nearly five years later and a full-blown dance family for whom nearly every Saturday between the end August and the beginning of December involves preparations for the production every ballerina dreams about...The Nutcracker. 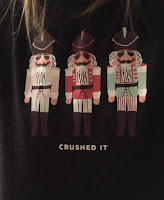 I didn't grow up going to see The Nutcracker during the holiday season. I assume productions of the show took place in my hometown of Madison, Wisconsin - the moderately-sized city has a thriving arts community - and even if The Nutcracker had not been performed on a stage in Madison, we could have easily driven to a slightly larger city like Milwaukee or Chicago to watch the Sugar Plum Fairy in all her glory. But we didn't. We had many lovely holiday traditions, but attending The Nutcracker was not among them. We now live in a relatively small community. College Station and Bryan together have less than 180,000 residents (excluding TAMU students), which means that unlike my hometown, the Brazos Valley can't exactly brag about a thriving arts community. It can, however, brag about Ballet Brazos and it's annual production of The Nutcracker. Ballet Brazos began in 2012 with the mission to "instruct, educate, and enrich young people and their audiences through the art of dance and provide quality classical ballet performances for the community". These performances "showcase local talent, cultivate an appreciation for the arts, and inspire the next generation of dancers". Collaborative efforts since Ballet Brazos' inception have contributed to the nonprofit organization's significant growth both in size and prestige. In this year's sixth annual production of The Nutcracker, Ballet Brazos welcomed professional dancers from the New York City Ballet*, guest artists from across Texas, and pre-professional ballerinas ranging in age from six to 18 from across the Brazos Valley. The professional dancers and guest artists turned in stunning performances as I expected they would, and the pre-professional dancers demonstrated their natural talent as well just how hard they have worked throughout the last four months in preparation for taking the stage. Combine the exceptional dancing with beautiful sets, stunning costumes, and a world-class stage and you have a spectacular show, one of which Ballet Brazos, the dancers, and the community can be proud. I don't rave about Ballet Brazos' The Nutcracker because Hallie just danced for the third time, or because I have a vested interest in the success of the show. 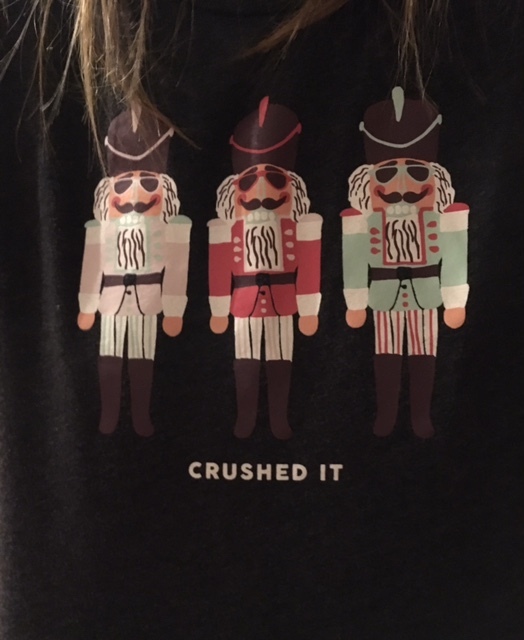 I rave about Ballet Brazos' The Nutcracker as someone who, as of five years ago, couldn't stand to watch ballet (true story) but who has come around because the production is just that good. I feel incredibly lucky to live in a community that can support a ballet-focused nonprofit organization as well as two sold-out shows in a 2,500-seat auditorium. I apologize for not getting this post up last week, when you could have still purchased tickets to this year's production. I promise to share information about tickets with plenty of lead time next year so that you too can kick off the holiday season with this beautiful and beloved Christmas tradition. "My heart is on that stage." Battle mice, ready to fight! With the Rat King (Dominick Oliver). dancers Indiana Woodward and Andrew Veyette). With Clara and Her Prince (Isabel Medrano and Seth York). she will have the opportunity to dance in The Nutcracker again. * The professional dancers who joined the production from the NYCB last year actually asked to come back. That should tell you something about the caliber and reputation of the show!